The GLAHS Board will meet Wednesday, March 20, 7:00 pm, at the modular office just south of the GL post office. All members of the community, as always, are invited to attend. It’s a Happening at the Kauffman House! February 21st, 6:30pm ‘til about 8:00 This is a NEW and sure-to-be-fun FREE event! Yummy Dessert followed by Story Sharing with Stephanie Wall! And YOU! We’ll gather in the warm Kauffman House Gallery! This writer’s grandsons have picked out their super hero, monster, and robot Valentines Day cards for all their classmates, and are just as excited as I remember being back in the day. 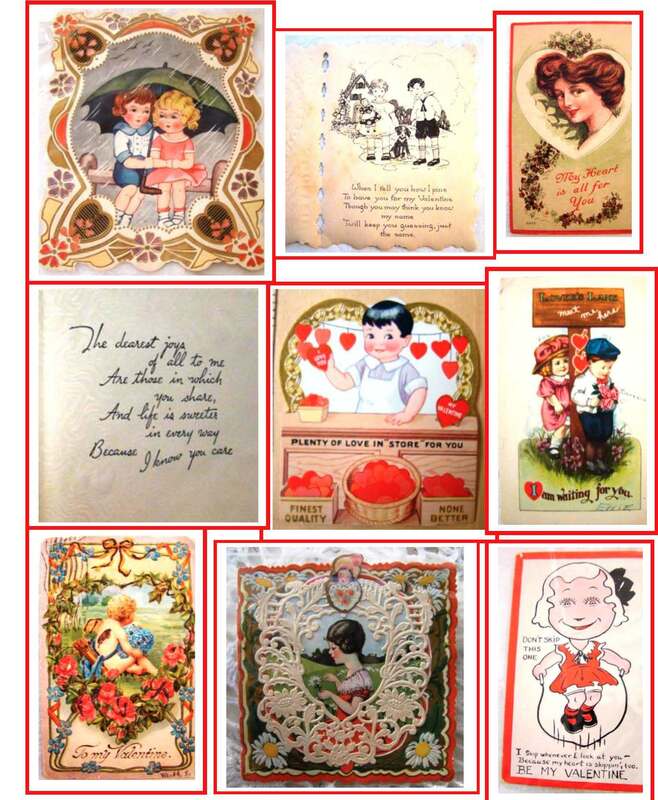 They didn’t even consider making handmade cards, as I remember doing on occasion, but I also remember hoping to get cards with popular characters from the newspaper comics and Disney, and of course a card from everyone in class! 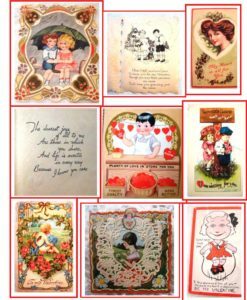 Enjoy these antique and vintage charming Valentines from the past, just a few of those originally displayed in 2009’s Kauffman House special exhibit. 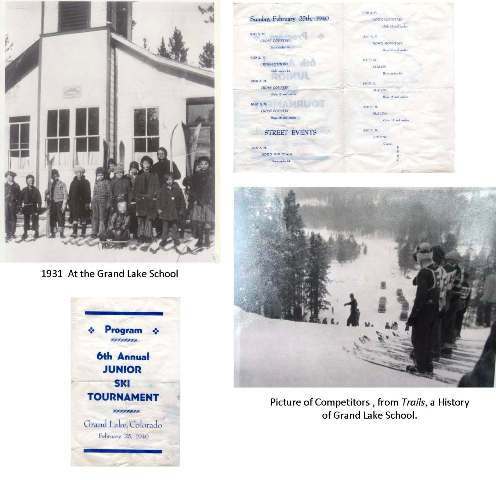 In the 1930s and ‘40s, the children of Grand County competed in downhill ski and other snowy events. Here in Grand Lake, the school at that time was at the corner of Broadway Street and Lake Avenue, where the Trinity Church manse is now located. What we now call the “tubing hill” was truly a ski slope, with tow rope, and the school kids practiced skiing almost daily. Then, in 1961, plans were completed for an entire ski area to be built on Shadow Mountain, but it never came to pass. Fun to think about! Solemn ceremonies took place around the world Sunday to mark 100 years to the day since the Armistice that saw the end of World War I. Grand Lake area young men were trained to enter that horrific war at the US Army’s Camp Funston located on Fort Riley southwest of Manhattan, Kansas. The Middle Park Times reported the news to a concerned public. Howard Beehler, first RMNP Ranger West Side in his WW I uniform. “November 9, 1917 Middle Park Times: Several Grand County boys were transferred to Camp Kearney, California from Camp Funston, last week. We were unable to learn all their names, but it is said that J. Johnson, Harry Swalm and Bill Lehman were among the transfers. The boys at Camp Funston report that they will have heat in their barracks in a few days. All inside pipes are installed now and waiting on the boiler station. Grand Lake ladies knitting an afghan for the soldiers. November 9, 1917 Middle Park Times: Word was received in Hot Sulphur Monday evening that Corporal Guy Ish, of Camp Funston was seriously ill with pneumonia and that his father had left Grand Lake to be with his son during the illness. We routinely send “snail mail” letter reminders when it’s time to renew your membership. We can instead send you an email renewal request, if you’d prefer. Just jet us a note, and we’ll set it up. 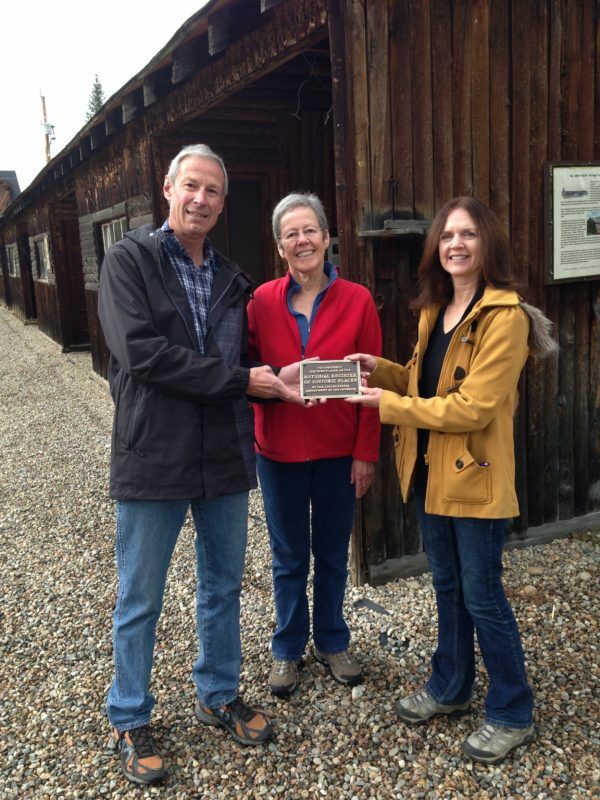 Pledging is an “easy” way to make a real impact on the work of the Grand Lake Area Historical Society. You decide the amount and when you wish to donate, and we’ll gratefully remind you each time your pledge payment is due. Major grantors are impressed by this show of continuing support, and we at GLAHS can more easily plan for future projects. Please do contact us if you would like to plan donations through a continuing pledge. You may also download and send us the Contribution Form attached to this message, and THANKS! You may have walked the trail around Monarch Lake, now a very popular USDA Forest Service site located 10 miles southeast of Highway 34 on CR 6, Arapaho Bay Road. Did you know that Monarch Lake is not a natural body of water, but was made when entrepreneurs T. S. Waltemeyer, the Wolcott brothers, and others built a dam on the South Fork of the Colorado and flooded a valley in the early 1900s to make it possible to float timber for their wooden box factory? 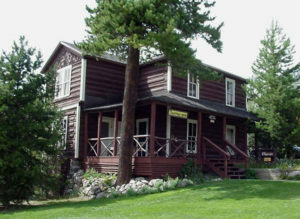 Mr. Waltemeyer’s Rocky Mountain Lumber Company developed through a series of sometimes questionable investment and successful mining projects, but did develop a substantial sawmill operation with flumes taking logs to the “lake” and a single locomotive railroad line, a spur off the Moffat Road called the Rocky Mountain Railway. The very small town of Monarch was a true company town, with bunkhouses for foreign workers, a store and school room combination, large men’s boarding house, a few cottages for married men, horse barn and bowling alley… all dependent on the lumber business and especially a box factory that used that lumber, but burned in Fall of 1908 after only some months of production. The town was then abandoned, though the lumber camp and sawmill remained. GLAHS board vice-president Kathy Means recently drove to Boulder to meet with Thomas Waltemeyer’s great granddaughter, Alice Murphy, and share photos and our considerable information. 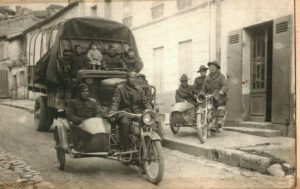 We scanned photographs not already in our collection from Alice’s albums, and share some below. … is the lady Corinne Lively wrote about in a GLAHS 2005-6 newsletter. She wrote: Who was Louise Millinger? “Grand Lake’s Best Known Woman”. 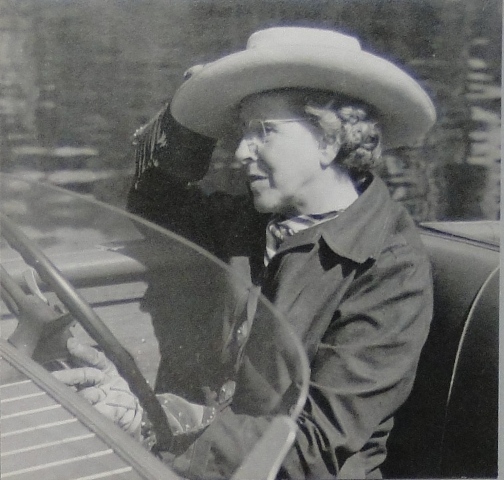 From 1933 through 1954 Grand Lake summers were graced by a “one woman Chamber of Commerce”. This unique character was Louise Millinger, operator of the Grand Lake Boat Service. 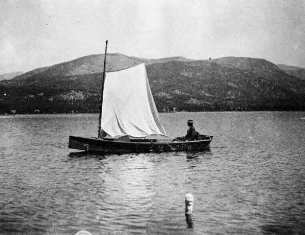 The Boat Service was started by her father, Captain McCarty, in 1909 with some canoes and one cylinder motorboats for the “wagon trade”. Louise and her husband Clem took over the business after the Captain’s death in 1933. Clem died suddenly two years later, and Louise, at age 49, continued doing what she loved. She spent her winters teaching at Minnequa school in Pueblo and writing fiction. 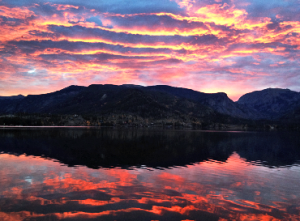 From the day school was out until the day it started in the fall, Louise was with her boats. She built the operation to six Chris Crafts, a 40′ steamboat “Micky”, and many small boats and canoes. She had shops capable of total motor rebuilding, and a heated and insulated hull refinishing shop. The Granby Children’s Fair in April featured all sorts of “Making and Tinkering” activities. 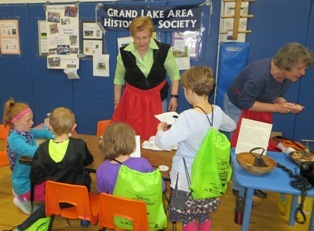 Your Grand Lake Area Historical Society brought the always popular and mystifying rotary phone and nut cracker, and helped scads of cute kiddos make Victorian style thaumatropes. Thanks to GLAHS board members Deb Bondi, Patti Stahl, Elin Capps and the folks at Grand Beginnings for all that great fun! Early resident Craig Adams spoke to the Grand Lake Rotary in 1955, and shared a remarkable boating event from his youth. We love to tell this story to groups of children… it’s a funny, cautionary tale. Enjoy! whether they were glad or sorry. You’ve noticed the many “quilt squares” on display on buildings around the County. The one at the Kauffman House is a “Lady of the Lake” pattern. 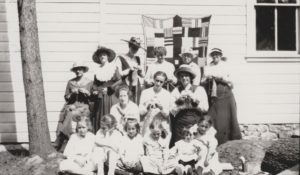 There’s now a booklet guide to all the quilt patterns which you can download from the Grand County Historical Association website, http://grandcountyhistory.org/. You’ve got to love an automatic garage door when the wind is roaring and there’s a bit of snow in the air. Our Smith Eslick Cottage Court had no doors on the carports, but each space had a roof, and was right next to where the owner slept. What luxurious security in 1915! We’re busy preparing some basic interpretive signage, funded in part with a grant from History Colorado – State Historical Fund, and additional support from our wonderful community. We’ll be able to share design plans in this coming summer, and plan to have the completed signage installed by spring of 2019. There’s lots planned at the Cottage Camp site, but so very much has already been accomplished – purchase of land, moving the historic one-of-a-kind Cottage Court to prevent its demolition, Master Planning for the site, restoration of the roof, placement of the Court on its first-ever permanent foundation, restoration of the entire Cottage Court to its 1915-1930s condition, interpretive signs at the entrance and Cairns #3 Ditch remnant, beginning development of exhibits, ADA accessible pathways, a rehabilitated Model A display and more. We’ll try hard to keep you apprised of every step along the way to making the Smith Eslick Cottage Camp an exciting and significant historical asset for our community, and THANK YOU to all who are participating in planning and to all who have donated to make this possible! 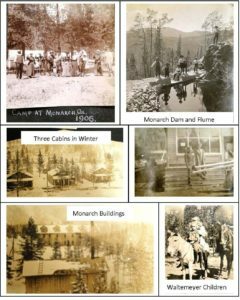 Grand Lake and the Smith Eslick Cottage Court were featured in Colorado Experience: Mountain Escapes shown on PBS February 1st. You can still watch the entire show online: http://www.rmpbs.org/coloradoexperience/home/ Don’t miss this! We’re excited and proud to have been part of this very interesting documentary presentation. Sandia Bruton has joined the GLAHS Board of Directors. “Sandy” is a longtime community member who was a docent at the Kauffman House with Patience Kemp and is again, with husband Bill. Sandia has a deep love of our community and its history, and we are thrilled to have her on our hard working board! We have a lot of wonderful history stories to tell. If you are part of a group that would like to have us present in PowerPoint or other format… subject of your choice, or one we have already prepared…give us a call or jot an email note. Having a party at your home? Call us! Need a topic for your organization’s meeting? Call us! Hope to hear from you! Snow or no snow, it’s a very busy spring at the Kauffman House and Smith Eslick Cottage Camp. Kathy Means and her team are working to install a variety of exhibits in the Gallery area of the Kauffman House Museum. Kathy’s calling it all “A Walk Back in Time”, and it will feature some early history. We would so very much welcome YOU as a docent guide at the museum! Just takes a few hours of your time and you will be supporting your community and having fun while you do it! Give us a call at 970/627-8324 and leave a message, or email historygrandlake@gmail.com. 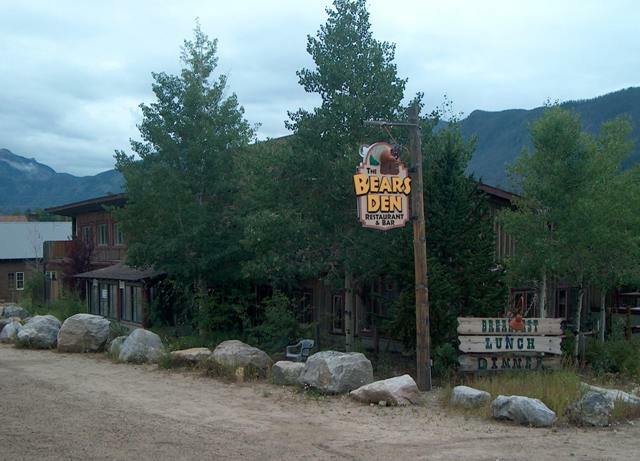 It was the El Navajo Lodge, a prominent accommodation for travelers back in the day. Stop by the Smith Eslick Cottage Court when you have a chance. It’s in process of being restored by Maple Street Builders, Architect Dennis Humphries and the Historical Society team. May 31, 1918 Middle Park Times: Through J.P.Schulz, the Eslick boys have purchased a Ford runabout. Grand Lake Items: George Nair and Clyde Eslick returned from Denver Saturday. 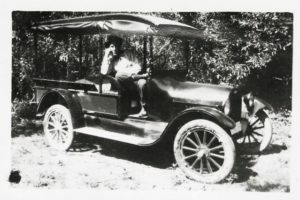 Grand Lake News: Mrs. Georgia Eslick and son, Mr. Clyde Eslick, and little Hazel Masterson, went to Denver and Fort Collins Wednesday and returned home Sunday. Grand Lake News: Mrs. Susan Johnston made a trip to Denver with Clyde Eslick during the week. Anne McCleave,State Historical Fund Preservation Specialist for the Northwest Region, has delivered a lovely brass plaque showing that the Smith Eslick Cottage Court is listed on the National Register of Historic Places. Here are a happy Jim Cervenka, Historical Society President, with Elin Capps and Anne. We’ll soon attach the plaque, and are of course continuing the restoration of the Cottage Court. Your Historical Society often receives donations that seem a bit unusual, but always have an interesting story to tell. Here’s a couple of recent additions! Some years ago, Mac Ruske and Martha Boehner shared what they remembered about the building in this photo. Mac said his shift boss on the Adams Tunnel project was Swede Sandstrom. When he and his wife Adele divorced, Adele and her friend Vannie Maker logged and built (with some unknown helpers) Adele’s home, shown in the photo. Mac said they used a lot of free stuff. Martha said it was later sold to Jo Anne (McLaren) Warner, wife of Jim Warner, son Tom, and continued as a home. At sometime, Martha said, it became a furniture store operated by the Clarks and their daughter Carol. 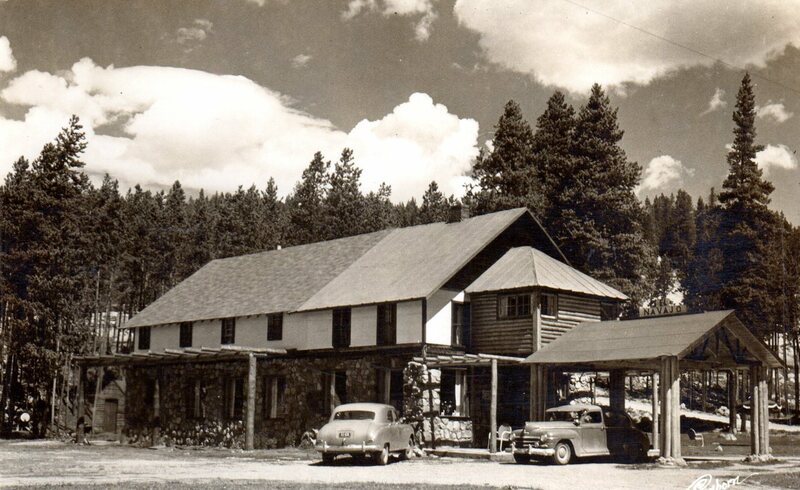 Then in 1965 it sold to Mr. and Mrs. Patty who operated it as the Patty’s Mountain Inn. Mac remembered Lynn Cox and her son Kevin telling him that fried chicken “the size of turkeys” were on the menu. Mr. Patty had a wind-up toy collection that he liked to line up parade style and send out to entertain. Kevin thought the best part were the wind-up, clacking dentures. 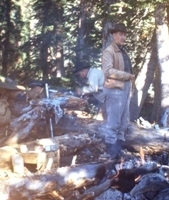 Then in 1981 it was sold to Dave McDougal, and operated as Dougal’s Mountain Inn. 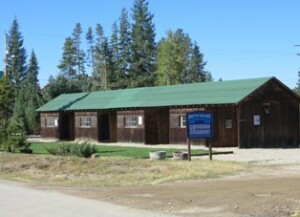 “Dougal” hosted the town’s first trivia contest as part of the Winter Carnival activities in about 1985, and would hire energetic young Pine Cone Theater actors as waiters. 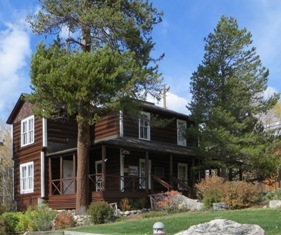 When Dave McDougal went to Denver and opened Dougal’s Catering, the restaurant was sold to Michelle Marcello, and operated as the Mountain Inn. Later, it sold to Benton and Vickie Johnson, and was operated as Bear’s Den. Does anyone remember this “Grand County –opoly” game, a “real estate trading game” that teased you could “own your own home town”? The GLAHS collection’s copy belonged to Hazel Mosely. Every “property card” is an ad for a local business. Perhaps you can figure out the game’s exact publication date by remembering when the businesses were active in town. Take a look at the game board, and let us know what you remember about those places! Your Grand Lake Area Historical Society needs you! We are a productive, exciting, very, very busy group of volunteers with so, so much to do! If you can spend a little time and lend us a hand, we’d be most grateful. We’re especially needing folks who can handle small building maintenance stuff, or folks to help in our crazy-busy office scanning pictures or recording historical information at the computer. How about learning how to update a web page? Would you be interested in helping us “tweet” or “snap-chat” or otherwise update our social media presence? We’ll offer training with any task you choose, and we’re eager to hear your ideas about what would be good for the team. Give us a call at 970/627-8324 or jet us a return e-mail. Thanks! The Kauffman House Museum has received a lovely exterior restoration, with log damage repaired or replaced, all the icky chinking between logs removed and replaced with authentic and substantial new daub, and a fresh coat of stain to make it glow. Huge thanks to the Colorado State Historical Fund/History Colorado for funding and patiently guiding us through this all-important project, and to everyone who donated grant matching funds. Thanks too to the crew: Dan Schneller/DSD Construction for log repair, Wes Bishop/Stonehinge Masonry for chinking, and Jim Peterson/Grand Design Painting for the lovely stain work. The trim has been painted during the summer of 2016 by Jim Peterson.